February 13, 2012 A survey by the Gallup Inc USA suggests that Nigerians do not embrace the anti-Western rhetoric of Boko Haram, the militant movement behind a series of deadly attacks in the country. About 6 in 10 Nigerians (adults of 15 and older) believe that greater interaction with the West is more of a benefit than a threat. In Boko Haram's Northeast home base, nearly 7 in 10 respondents say the same. Majorities of residents in other northern regions, which are home to many Muslims, also view such interaction as beneficial. Do you believe that greater interaction between Muslims and western societies is more of a threat or more of a benefit? In the predominantly Christian South, attitudes about increased interaction with the West range widely from 8 in 10 in favor in the Southwest to 2 in 10 in favor in the Southeast, the region that is least likely to view such interaction as a benefit. 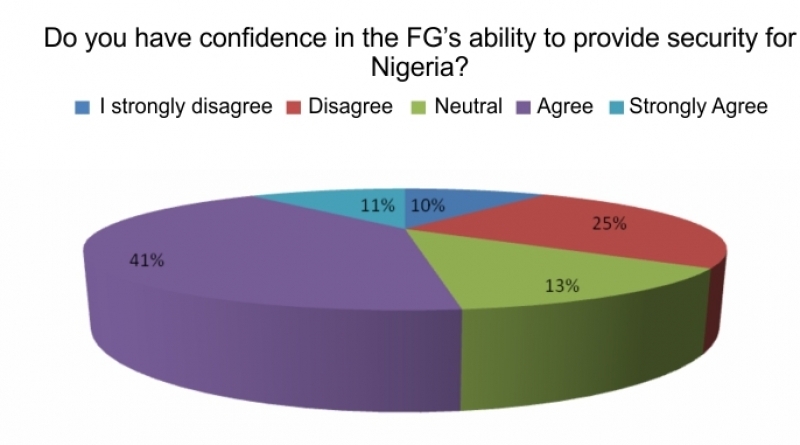 These survey results lend credence to the August 2011 snap poll conducted by NOI Polls on Boko Haram. In the security snap poll by NOI Polls, 9 in 10 Nigerians are aware of the group known as Boko Haram and 52% of Nigerians expressed confidence in the government’s ability to provide security (Agree and strongly agree) while 35% of respondents said they lacked confidence in the government’s ability to provide security (Disagree and strongly disagree), and 13% neither had confidence nor lacked confidence in the government’s ability to provide security for Nigerians. In addition, given the spate of bombings and kidnappings linked to the group, the snap poll conducted by NOI Polls further sought the opinion of Nigerians on how to solve the Boko Haram issue. The results showed that majority of the respondents (44%) were of the opinion that the government should employ military force to tackle the issue; while 33% said FG should dialogue with the group. Also, 9% agreed that the FG should first investigate the matter and find out what compels the group to engage in terrorist activities. Surprisingly, only 3.8% of Nigerians agree that the FG should grant amnesty to the terrorist group. How do you think the federal government should handle this issue? Similarly, the recent Gallup survey revealed that northerners are of the opinion that Sharia should not be the only Source of Legislation. The results show that majority of residents in the Northeast region (64%) said that Sharia must be one of the sources of legislation, representing the region with the highest scores. However, no resident in the Northeast region said Sharia must be the only source of law, while 36% said it should not be a source at all. Residents in the southern regions, where relatively few Muslims live, are the most likely to believe Sharia should not be a source of national legislation. In general, which of these statements comes closest to your own point of view? Results from the Gallup survey are based on face-to-face interviews with 1,000 adults, aged 15 and above; conducted in April 2010 and August 2011 in Nigeria. Similarly, respondents for the NOI snap polls were randomly selected from a database of phone-owning Nigerians aged 18 and above across the six geopolitical zones in the country. In total, 1155 respondents took part in the telephone interviews conducted between the 3rd and 8th of August, 2011. It can be said with 95% confidence that the maximum margins of sampling error for both sample sizes are ±4 percentage points. The margin of error reflects the influence of data weighting. In addition to sampling error, question wording and practical difficulties in conducting surveys can introduce error or bias into the findings of public opinion polls. The snap poll project is part of the ongoing survey exercise conducted by NOI Polls to rapidly assess public sentiments regarding various social, political or economic issues. NOI Polls Limited is Nigeria’s leading opinion research and knowledge management organization, which has been working in technical partnership with Gallup Inc. (USA) since 2007, to conduct periodic opinion polls and strategic research on various socio-economic issues in Nigeria.